Andre van Rüschen has no memory of the day he lost all feeling in his legs. After a car accident in Germany, he had a spinal cord injury that left him paralyzed from the waist down. When he woke up from a coma in a hospital in Hamburg, the doctors told him he would never walk again. But now, thirteen years later, van Rüschen is back on his feet, and he is training to compete as a pilot in the Powered Exoskeleton race at the Cybathlon in Zurich this month. In a high-rise office building on Leipziger Platz in Berlin, he slides out of his wheelchair onto a black leather pouf where a ReWalk exoskeleton sits folded. The black metal frame of the robotic machine, which has two powered legs and a control box that sits above the hip, mimics the lower half of the human body. Van Rüschen positions himself between the legs of the exoskeleton. He straps on the sensor-laden motors at three points along his own legs: below the knees, above the knees and around his upper thighs. He then secures the control box on his lower back with velcro belts. With the machine clasped around the key joints needing support, he slowly slips his hands into a couple of black crutches and hits the “stand” button on the round remote strapped around his left wrist. A couple of beeps later, he leans his upper body forward as the machine makes a whirring sound as it pushes him into a standing position. Moments later, when van Rüschen hits another button on his watch-like remote, his right foot moves forward, followed by the left. He uses his upper body strength to shift his weight between his feet as he walks out of the building onto the streets of Berlin. 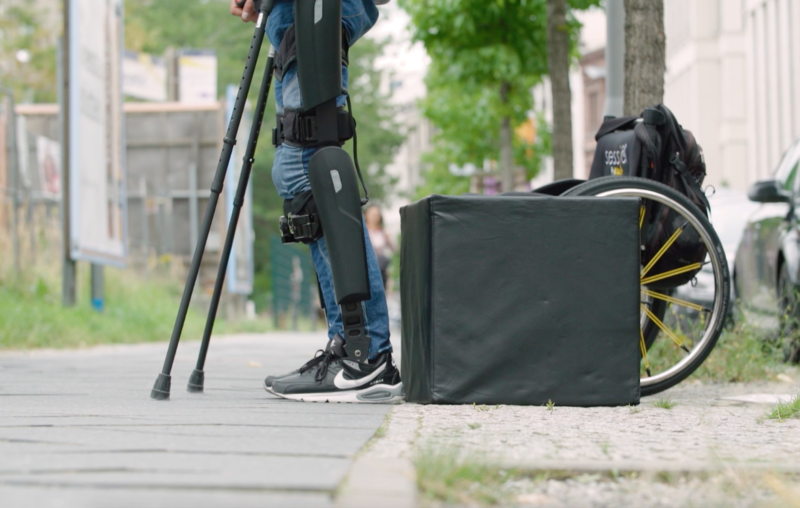 Van Rüschen was one of the first European testers of the exoskeleton from ReWalk, a company that builds robotic systems to enable people with spinal cord injuries to stand, walk and even climb stairs again. He applied to receive a personal ReWalk machine three and a half years ago and has tested every iteration of the exoskeleton since then. Before his accident, van Rüschen worked as a car painter in his family-run business, but now he works for ReWalk and is often invited to demonstrate the strengths of the company’s exoskeleton technology at corporate conventions and fairs. The history of the company that van Rüschen now represents echoes his own experience. Founded in 2001, the ReWalk exoskeleton was invented by Dr. Amit Goffer, an Israeli scientist who became a quadriplegic after an ATV accident in the late ’90s. The machine that he devised not only allowed him to step away from a wheelchair but is now actively used by 264 people across the world. While a number of studies that gauge the overall health benefits of the technology are now slowly taking shape, the company has already set up operations in the U.S. and Germany in addition to Israel, where the exoskeleton is developed and manufactured. The company’s sixth-generation exoskeleton, which is on the market and will be used for the Cybathlon race, has the battery life for about eight hours in an office setting, where a user might sit, stand or walk at various intervals, or it can be worn for up to four continuous hours of walking. While the technology got van Rüschen out of his wheelchair, it does not work the same way for all spinal cord injuries. To qualify as a ReWalk user, each individual has to undergo medical screenings that determine the extent of the injuries. One of the main requirements to become a “ReWalker” is to have enough upper body functionality and control to be able to use the arms and shoulders to maneuver the crutches that accompany the exoskeleton. Beyond the impact of the injury, factors like age, height and weight help ReWalk’s physical therapists determine the right fit for the exoskeleton. At present, the machine can assist a user who is between 5’3″ and 6’3″ in height and weighs a maximum of 220 pounds. At about 6’3″, van Rüschen was a perfect match even for the very early, bulkier iterations of ReWalk. And now, years later, as one of their most experienced users, he is the clear choice for the exoskeleton race at the Cybathlon. The obstacle course that he will tackle will have pilots sit on and stand up from a couch, walk on stones immersed in water, go over and down a ramp, and walk on an inclined slope before climbing stairs at the end. The course is designed to push the limitations of existing exoskeletons. 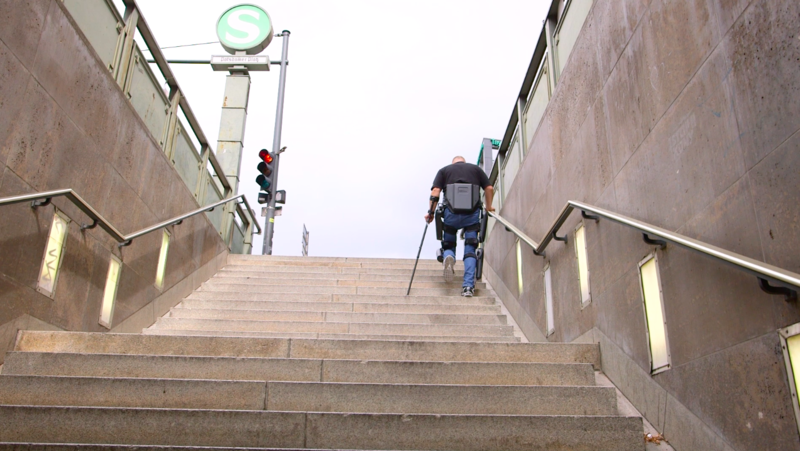 While van Rüschen uses the exoskeleton on stairs and a variety of surfaces on a daily basis, tasks like walking on a slope and on slippery stones are expected to be challenging not just for him but for the exoskeleton as well. The algorithms required to keep the machine stable on varying surfaces are complicated and far from perfect. But, the technical team at ReWalk is working to optimize the existing software in their commercially available exoskeletons. In preparation for the race, they are testing and tweaking the settings to switch up the pace, the leg extensions and the time gaps between steps so that the exoskeleton can take on all the challenges of the Cybathlon.